Warm in the sense of friendly I mean – although we did also need to open windows. 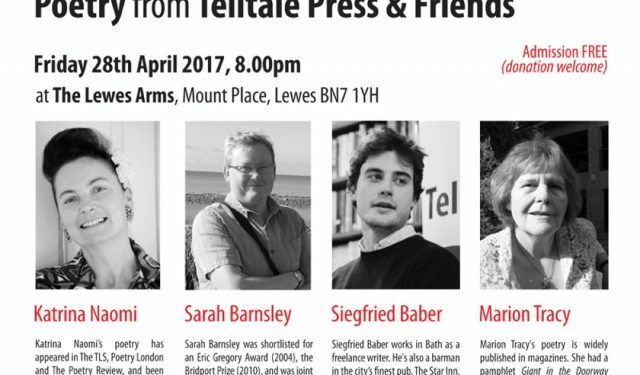 I’m of course talking about last Friday and our latest Telltale Poets & Friends readings at the Lewes Arms. It’s a delightfully intimate pub, no longer with an actual stage upstairs but still a great venue for poetry readings. Plus it’s sort of become our mothership. Sorry, no pics this time – except the ‘before’ photo of the room, so that I could see how the tables needed to go back before we moved them all – so you just have to imagine how our readers looked, especially Katrina in her beautiful vintage frock. Telltale’s Siegfried Baber and Sarah Barnsley gave us storming sets with many new poems, and it was a pleasure to welcome Marion Tracy and Katrina Naomi as our guest poets. It’s just occurred to me that they have something in common, in that they have surnames that could be first names – spooky! I’m glad I didn’t think of that before the intros, or I would have certainly said “Please welcome Tracy Marion!” or something equally daft. Katrina, who had journeyed up from Penzance, mesmerised us with her witty and moving poetry. She had to contend with noisy blokes outside AND the sudden dramatic collapse of our roller banner, but she carried on like a true pro. Marion’s reading was excellent as always – surreal and joyously unpredictable poems. 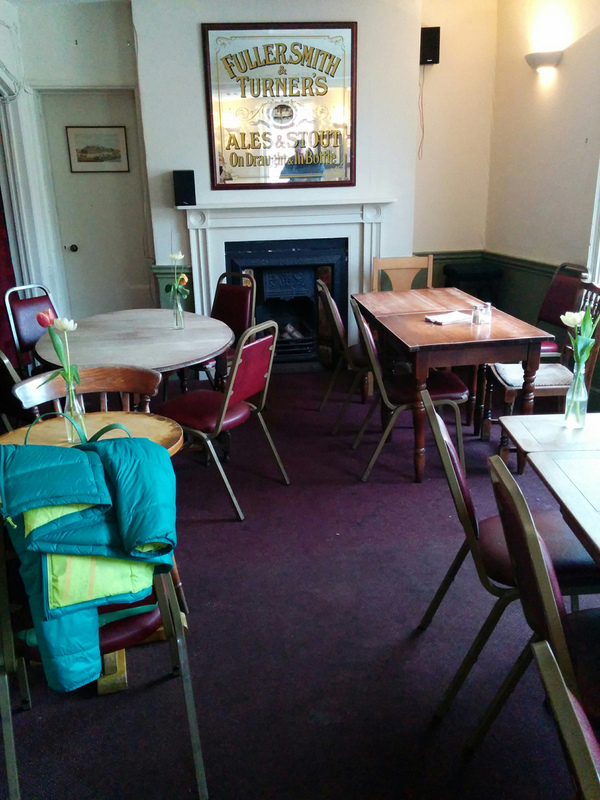 Our cosy room, before we moved the tables and everyone arrived – ! 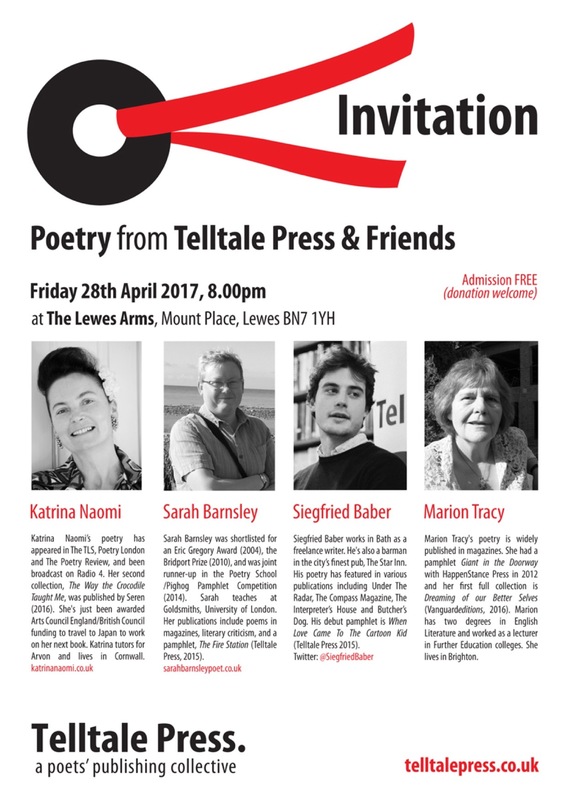 Spring is here and with it another sparkly Telltale Press & Friends’ reading in Lewes, kicking off the Bank Holiday weekend in style on Friday 28 April 2017 @ 8pm. Our guest poets come from near and far. From Penzance we are delighted to present Katrina Naomi, whose spectacular second collection, The Way the Crocodile Taught Me (Seren, 2016) is a must-read; and we are thrilled to be joined by Brighton-based Marion Tracy, whose dazzling debut collection Dreaming of our Better Selves is fresh out from VanguardEditions. Telltale poets Siegfried Baber (When Love Came To The Cartoon Kid, singled out by The TLS as one to watch) and Sarah Barnsley (The Fire Station) complete the lineup in what promises to be an exquisite evening. The event is at the Lewes Arms and admission is FREE (donations welcome). We hope you can join us! 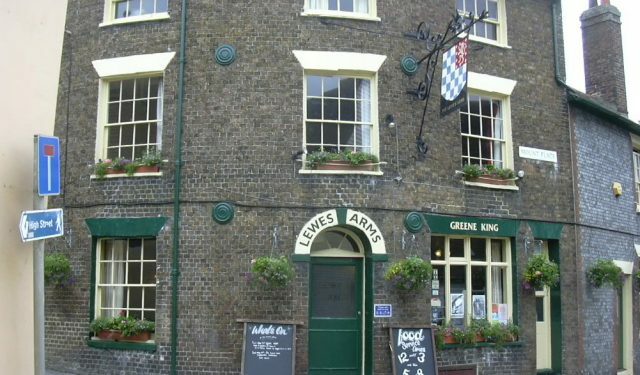 How to find the Lewes Arms.